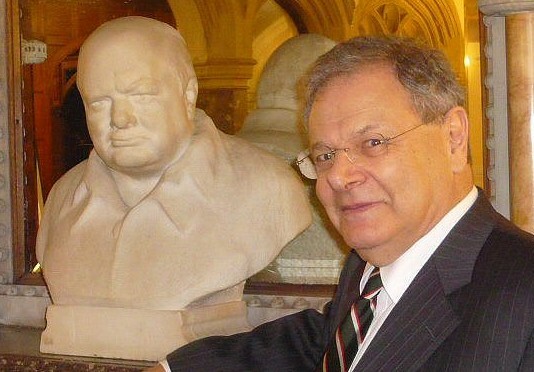 PHOTO : Martin with the Nemon bust of Churchill, photo courtesy Lady Young. It is now nearly four years since Martin died, and six and a half since he published a word. But I am continually amazed at how his work and his reputation for being, in Dennis Prager’s words, an “honest writer” continue to hold sway and to be quoted, consulted, and relied upon. I have tried in these newsletters, to call attention to these varied “honourable mentions”, in the Web Citings below. I never know what will turn up, but something always does. Because of the EU’s change in data protection laws, it seems that some online articles are no longer accessible. This has led to an exchange of emails with those publishers in order to get permission to see and quote from their articles. Tommy P. Baer writes from Richmond, Virginia and sent me a scan of his article on Kristallnacht, and his quote of Martin in the Web Citings below. Mr Baer writes to me “It was my privilege to quote your husband and celebrated author in my op-ed piece. It is indeed from his book, Kristallnacht, Prelude to Destruction, the definitive work on this tragic event.” Mr Baer, an international lawyer and someone who has been recognised for his many humanitarian endeavours adds, “I was born in Berlin and was three months old on November 9.” As Martin would say, what might have those who had been killed done in their lives if they had lived? While not a Web Citing, there was an “honourable mention” in Aurelia Young’s excellent book on her father the sculptor Oscar Nemon, Finding Nemon. Lady Young mentions Martin’s book Churchill and the Jews in which Nemon notes his discussions with Churchill at Chequers. Martin had told me that Nemon had offered to do his bust, but sadly Nemon died before it could happen. Martin continues to be an inspiration, as he was balanced in his perspective, scrupulous in his work, and generous with his expertise.